Thoughts: What is in chicken salt? Us Aussies love to put chicken salt on our chips - or french fries as the Americans say! 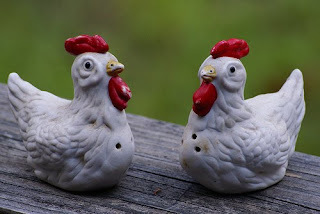 Chicken Salt is a seasoning comprising table salt blended with herbs, spices, flavourings, and sometimes monosodium glutamate, often containing chicken extracts. Ingredients for store purchased chicken salt are: Salt, Natural Chicken Extract, Paprika, Onion, Garlic, Acidity Regulator (Citric), Wheat Starch, Pepper, Celery Seed and monosodium glutamate. 1 organic chicken boiled in water. Use the juice from this, aka as chicken stock and use a dehydrator to dry the stock to a powder where you can form cubes like Chicken Bouillon Cubes. The ones you buy in the supermarket are made by dehydrating chicken stock with high amounts of sodium, then forming it into a small cube. It is the sodium you want to stay away from, not to mention the chicken overdosed on antibiotics and hormones! If you do not have a dehydrator then buy organic chicken bouillon and use 4 tablespoons in this recipe. And worse case, if you cannot source organic then purchase regular - and at least you are making your very own chicken salt MSG free! Once you have your own dehydrated chicken stock, or organic chicken bouillon, mix all ingredients in a bowl. And whalaaaa Chicken Salt! Quotes: It is what we say it is, and nothing else. 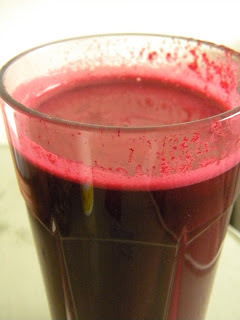 Meal 1: A beetroot (beet), celery, ginger, carrot and spinach juice! Meal 2: Fresh orange juice - I juiced 2 oranges - mmm! Created from honey, lemon, cashew nuts, coconut and vanilla! Meal 5: A Raw Burger! 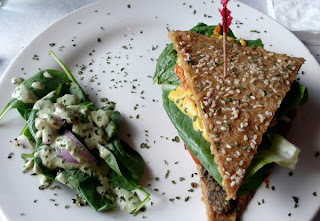 The best raw I've ever had at Raw Soul in Manhattan! Created with sprouted quinoa and flax dehydrated buns, walnut pumpkin seed, brazil nut, onion, celery, flax oil patty, lettuce, tomato, onion, barbecue sauce (apple cider) and mustard. Meal 6: Raw Jicama fries! 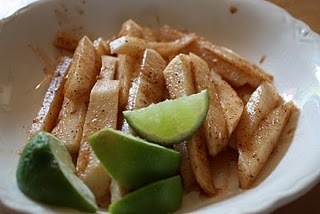 With apple cider, nutmeg, oregano and lime! Exercise: A run in the morning, and a stretch and a sauna later at Big Al's Family Fitness! And a beautiful walk around Central Park with a beautiful friend.